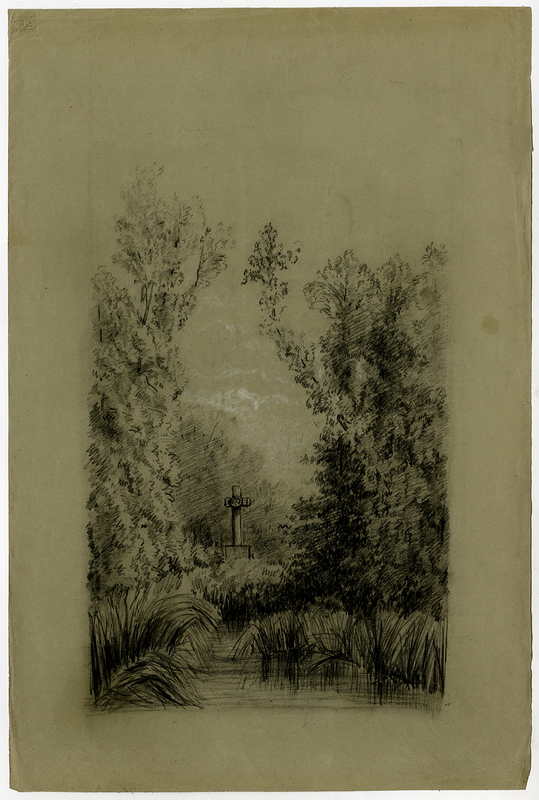 Subject: Antique drawing, untitled. View of a cross in a landscape near a pool. Condition: Good, given age. Ample margins. A small dampstain in the right margin. Some creasing in the margin corners and edge. General age-related toning and/or occasional minor defects from handling. Please study scan carefully. Medium: Chalk on grey wove paper. Size (in cm): The overall size is ca. 32.3 x 48.5 cm. The image size is ca. 32.3 x 48.5 cm. Size (in inch): The overall size is ca. 12.7 x 19.1 inch. The image size is ca. 12.7 x 19.1 inch. Description: The sky was lightly accented with white chalk in a few places.